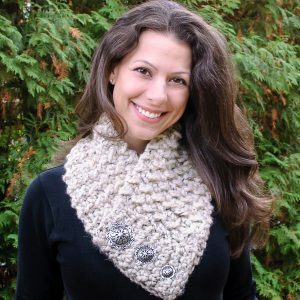 Today’s pattern is for a super versatile piece … goes from cowl to wrap with just a little tug over the shoulders. It looks just as awesome with a pair of jeans as it does for a night on the town. 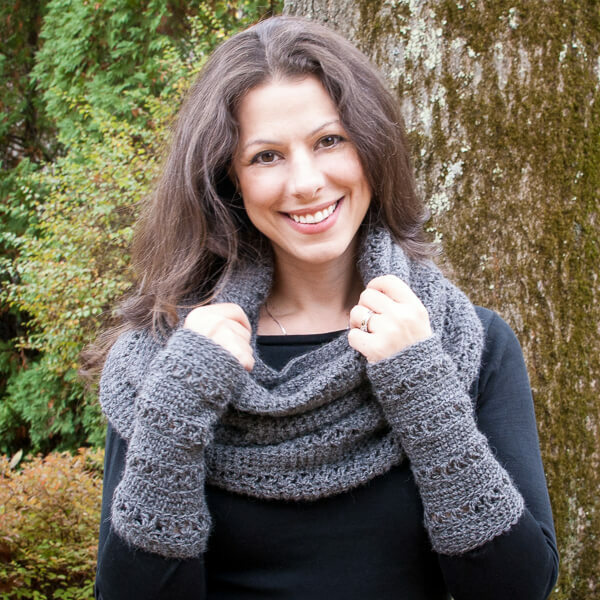 I hope you’ll give this Versatile V-Stitch Cowl to Wrap Crochet Pattern a try … and don’t be intimidated by the length of the instructions; it’s all basically the same repeated 7 rows with some increases thrown in. You can find the pattern for the matching wristwarmers here. Gauge: 12 sc and 12 rows = 4 inches. Finished piece when laying flat measures approximately 13½ in. at the neck, 21 in. at the bottom, and 24 in. long. Keep in mind this isn’t the circumference, just the side to side measurement when laying flat. V-stitch (V-st) — [1 dc, ch 1, 1 dc] in specified stitch. Ch 80, Sl st in furthest ch from hook to begin working in the round, taking care not to twist the chain. Row 1: Ch 1 (does not count as st here and throughout), work 1 sc in same ch as join and each ch around, join — 80 sc. Row 2: Ch 1, working in back loops only this round, work 1 sc in same st as join and each st around, join — 80 sc. Rows 3 through 5: Ch 1, work 1 sc in same st as join and each st around, join — 80 sc. Row 6: Ch 1, working in back loops only this round, work 1 sc in same st as join and each st around, join — 80 sc. Row 7: Ch 4 , work 1 dc in same st as join (counts as first V-st), skip next st, *V-st in next st, skip next st, repeat from * around, join in 3rd beginning ch — 40 V-sts. Row 8: Ch 1, work 2 sc in the ch-sp of each V-st around, join — 80 sc. Row 9: Ch 1, working in back loops only this round, work 1 sc in same st as join and each st around, join — 80 sc. Rows 10 through 23: Repeat Rows 3 through 9 twice. Rows 24 and 25: Ch 1, work 1 sc in same st as join and each st around, join — 80 sc. Rows 26: Ch 1, work 2 sc in same st as join, work 1 sc in next 39 sts, work 2 sc in next st, work 1 sc in remaining sts, join — 82 sc. Row 27: Ch 1, working in back loops only this round, work 1 sc in same st as join and each st around, join — 82 sc. Row 28: Ch 4 , work 1 dc in same st as join (counts as first V-st), skip next st, *V-st in next st, skip next st, repeat from * around, join in 3rd beginning ch — 41 V-sts. Row 29: Ch 1, work 2 sc in the ch-sp of each V-st around, join — 82 sc. Row 30: Ch 1, working in back loops only this round, work 1 sc in same st as join and each st around, join — 82 sc. Rows 31 and 32: Ch 1, work 1 sc in same st as join and each st around, join — 82 sc. Rows 33: Ch 1, beginning in same st as join, *work 2 sc in same st as join, work 1 sc in next 19 sts, work 2 sc in next st, work 1 sc in next 20 sts, rep from * once more, join — 86 sc. Row 34: Ch 1, working in back loops only this round, work 1 sc in same st as join and each st around, join — 86 sc. Row 35: Ch 4 , work 1 dc in same st as join (counts as first V-st), skip next st, *V-st in next st, skip next st, repeat from * around, join in 3rd beginning ch — 43 V-sts. Row 36: Ch 1, work 2 sc in the ch-sp of each V-st around, join — 86 sc. Row 37: Ch 1, working in back loops only this round, work 1 sc in same st as join and each st around, join — 86 sc. Rows 38 and 39: Ch 1, work 1 sc in same st as join and each st around, join — 86 sc. Rows 40: Ch 1, beginning in same st as join, *work 2 sc in same st as join, work 1 sc in next 13 sts, work 2 sc in same st as join, work 1 sc in next 14 sts, work 2 sc in same st as join, work 1 sc in next 13 sts, rep from * one more, join — 92 sc. Row 41: Ch 1, working in back loops only this round, work 1 sc in same st as join and each st around, join — 92 sc. Row 42: Ch 4 , work 1 dc in same st as join (counts as first V-st), skip next st, *V-st in next st, skip next st, repeat from * around, join in 3rd beginning ch — 46 V-sts. Row 43: Ch 1, work 2 sc in the ch-sp of each V-st around, join — 92 sc. Row 44: Ch 1, working in back loops only this round, work 1 sc in same st as join and each st around, join — 92 sc. Rows 45 and 46: Ch 1, work 1 sc in same st as join and each st around, join — 92 sc. Rows 47: Ch 1, beginning in same st as join, *work 2 sc in same st as join, work 1 sc in next 15 sts, work 2 sc in same st as join, work 1 sc in next 14 sts, work 2 sc in same st as join, work 1 sc in next 14 sts, rep from * one more, join — 98 sc. Row 48: Ch 1, working in back loops only this round, work 1 sc in same st as join and each st around, join — 98 sc. Row 49: Ch 4 , work 1 dc in same st as join (counts as first V-st), skip next st, *V-st in next st, skip next st, repeat from * around, join in 3rd beginning ch — 49 V-sts. Row 50: Ch 1, work 2 sc in the ch-sp of each V-st around, join — 98 sc. Row 51: Ch 1, working in back loops only this round, work 1 sc in same st as join and each st around, join — 98 sc. Rows 52 and 53: Ch 1, work 1 sc in same st as join and each st around, join — 98 sc. Rows 54: Ch 1, beginning in same st as join, *work 2 sc in same st as join, work 1 sc in next 16 sts, work 2 sc in same st as join, work 1 sc in next 15 sts, work 2 sc in same st as join, work 1 sc in next 15 sts, rep from * one more, join — 104 sc. Row 55: Ch 1, working in back loops only this round, work 1 sc in same st as join and each st around, join — 104 sc. 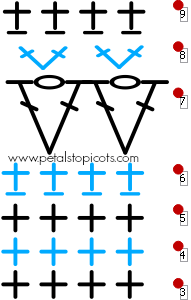 Row 56: Ch 4 , work 1 dc in same st as join (counts as first V-st), skip next st, *V-st in next st, skip next st, repeat from * around, join in 3rd beginning ch — 52 V-sts. Row 57: Ch 1, work 2 sc in the ch-sp of each V-st around, join — 104 sc. Row 58: Ch 1, working in back loops only this round, work 1 sc in same st as join and each st around, join — 104 sc. Rows 59 and 60: Ch 1, work 1 sc in same st as join and each st around, join — 104 sc. Rows 61: Ch 1, beginning in same st as join, *work 2 sc in same st as join, work 1 sc in next 17 sts, work 2 sc in same st as join, work 1 sc in next 16 sts, work 2 sc in same st as join, work 1 sc in next 16 sts, rep from * one more, join — 110 sc. Row 62: Ch 1, working in back loops only this round, work 1 sc in same st as join and each st around, join — 110 sc. Row 63: Ch 4 , work 1 dc in same st as join (counts as first V-st), skip next st, *V-st in next st, skip next st, repeat from * around, join in 3rd beginning ch — 55 V-sts. Row 64: Ch 1, work 2 sc in the ch-sp of each V-st around, join — 110 sc. Row 65: Ch 1, working in back loops only this round, work 1 sc in same st as join and each st around, join — 110 sc. Rows 66 and 67: Ch 1, work 1 sc in same st as join and each st around, join — 110 sc. Rows 68: Ch 1, beginning in same st as join, *work 2 sc in same st as join, work 1 sc in next 13 sts, work 2 sc in same st as join, work 1 sc in next 13 sts, work 2 sc in same st as join, work 1 sc in next 13 sts, work 2 sc in same st as join, work 1 sc in next 12 sts, rep from * one more, join — 118 sc. Row 69: Ch 1, working in back loops only this round, work 1 sc in same st as join and each st around, join — 118 sc. Row 70: Ch 4 , work 1 dc in same st as join (counts as first V-st), skip next st, *V-st in next st, skip next st, repeat from * around, join in 3rd beginning ch — 59 V-sts. Row 71: Ch 1, work 2 sc in the ch-sp of each V-st around, join — 118 sc. Row 72: Ch 1, working in back loops only this round, work 1 sc in same st as join and each st around, join — 118 sc. Rows 73 through 75: Ch 1, work 1 sc in same st as join and each st around, join — 118 sc. Row 76: Ch 1, working in back loops only this round, work 1 sc in same st as join and each st around, join — 118 sc. Try my Quick and Comfy Scarfie here. Previous Post: « Hookin On Hump Day #83: Link Party for the Fiber Arts! looking for copyright info on this pattern. I would like permission to make them to sell. Please advise! Thanks! Hi Juanita 🙂 You are welcome to use this pattern to make and sell finished cowls. I would love if you could include a note in your listing crediting Petals to Picots for the pattern with a link back to this post. Thanks!! Gauge please. I wanted to start making this today. Thankyou sooo much. The cowl is gorgeous! Could you give a hint as to increasing the pattern. I have a friend that is a 3x and I would love to make it for her. Thank you, and love the look! I love this pattern, but it’s amazing how hard it is to adjust for different yarns. I don’t have quick access to the same as what’s used here and dk weight is not common in my local stores. Closest is baby weight, but that’s still different. And the stretchability is a huge factor. Frogged this one twice now. Hoping third time’s the charm. I have been hunting for a pattern just like this and didn’t know what to call it. I didn’t want a long scarf, just something to throw on to keep my upper body warm in the evenings. This is beautiful. I wanted to pin it on my Pinterest board but Pinterest can find no picture so it won’t pin…..hmmm. I copied and pasted to a word document instead. Thank you so much for sharing this! You might try copying the page address from the browser you use and past it in Pinterest in a website search. It should bring up all of the pictures to choose from. Or search the pattern title in pinterest and you will find several already pinned. What might be another yarn that could be used that might be a little less expensive? I love this design! I would be honored if you would link it up at our Found & Foraged Linky party tonight starting at 8PM CST over at http://www.thebigrevealblog.com if you were interested. Hope to see you there! Love this! And am anxiously awaiting the wristwarmer pattern, too. Any idea when you might be ready to post it? What a beautiful pattern! I think my daughter will love it. I do have one question: In row 72 there are 118 stitches, but at the end of row 75 — after three rows of sc with no decreases — there are 80 stitches. Is this a mistake or is there something I missed? Thanks. Just a typo … I fixed, Marie 🙂 Thanks so much for letting me know! Hello, I was wondering what yarn weight to use for this? And a gauge would be helpful too. Lovely cowl, thank you for sharing. Love it! I will make this!! Could you give an approximate gauge?